Buy Animation Nights New York (ANNY) a Coffee. ko-fi.com/animnightsny - Ko-fi ❤️ Where creators get paid by fans, with a 'Buy Me a Coffee' button. 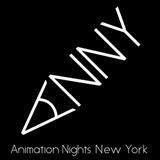 Animation Nights New York (ANNY) is a curated monthly screening event and annual festival held in NYC. We show animated short films and virtual reality animation experiences from all around the world. ANNY Best of Fest is a two day symposium featuring Animation Screenings, Virtual Reality Animation Experiences, Fine Art Exhibits, Professional Panels, and Industry Events held in NYC. Help us keep Animation Nights New York monthly screenings FREE! Secured Payments. Support goes to Animation Nights New York (ANNY)'s account. Upgrade Animation Nights New York (ANNY) to a yearly Gold Membership with a one-time payment.